The objectives of this study were, firstly, to establish the mechanism by which modified clinoptilolite (in Na form) adsorbs lead ions and, secondly, to assess the extent of influence of pH on the adsorption capacity. To this end, the experimental data have been fitted by adsorption isotherms, thermodynamic and kinetic models. Based on the standard errors obtained during experiments, it was determined that the accuracy of prediction of the isotherm models considered for adsorption decreases in the order: Dubinin-Raduschkevich (4.63%, average normalised standard deviation error); Langmuir (7.90%); and Freundlich (15.98%). For the kinetic models, the accuracy of prediction decreases in the order: intra-particle Weber-Morris (with an average normalised standard deviation error of 5.53%); heterogeneous diffusion (5.67%); pseudo-second order kinetic model (10.47%); diffusion through the particle surface (41.73%); and the pseudo-first kinetic model (47.51%). The mechanism of adsorption of lead ions by Na-clinoptilolite was found to occur in a monolayer and heterogeneous surface. The pH of contact solutions played an important role owing to competition by hydrogen ions. As the pH of the solution decreased, the maximum monolayer adsorption capacity established theoretically, based on the Langmuir isotherm, also decreased. Thus, if, for instance, the pH decreases from 4 to 1, the maximum adsorption capacity decreases from 0.3569 to 0.1604 mol-kg-1. At high pH of the contact solution, the adsorption process occurs by ion exchange and at low pH; i.e., it is physical. The variation of the Gibbs free energy demonstrates that adsorption occurs spontaneously. The process was also observed to occur at a higher rate at low acidity. Diffusion through the internal structure of macro- and micropores is the stage taking place with the lowest speed during the adsorption process and plays an important role in the mechanism of adsorption. The intra-particle diffusion coefficient depends on pH, which can modify the shape and concentrations of the hydrated metal complexes in solutions, thus affecting the adsorption process. The decrease of pH from 4 to 1 resulted in a decrease of the intra-particle diffusion coefficient from 4.0610-11 to 1.9610-11 m2min-1. The film diffusion coefficients were found to be 10 times larger than the intra-particle coefficients, suggesting that diffusion to the external surface cannot be the rate-limiting step in the adsorption mechanism. the hydrated radii of adsorbed ions and the magnitude of the dehydration energy. In order to achieve high adsorption capacities, zeolites are often conditioned chemically. In general, natural zeolite is activated when the cations present in a solution substitute the cations in the zeolite structure. The substituting cations result in a uniform energy of adsorption on the surface of the zeolite because of their smaller volume, while they increase the adsorption capacity because of their higher mobility. The hydrated radii of NH4+, K+ and Na+ cations is smaller than the radii of Ca2+ and Mg2+ ions; and the hydration energies of the former are lower than the hydration energy of the latter (Trgo et al., 2006a; Coruh, 2008; Gorka et al., 2008). The activation cations which replace the Ca2+ and Mg2+ cations of the zeolite display a higher availability for ion exchange, thus explaining why the adsorption capacity of activated zeolite increases (Doula, 2006). In clinoptilolite conditioned with a NaCl solution, the concentration of Na+ increases and the concentration of Ca2+ decreases, subsequently leading to an increase of the Na+/Ca2+ ratio. The conditioning of zeolite with a HCl solution determines the growth of the Si/Al ratio to some extent, as well as the increase of the relative amount of K+ in clinoptilolite, subsequently decreasing the Na+/K+ ratio (Inglezakis et al., 2004; Gunay et al., 2007). The pH of the contact solution is an important parameter controlling the adsorption process. The adsorption capacity decreases as the acidity of the contact solution increases. These variations can be explained by the competition between metal ions and hydrogen ions and by the variation of hydrolysis products of metal ions with pH (in this study we only discuss adsorption of ions and not their precipitation at low pH) (Athanasiadis and Helmreich, 2005; Smiciklas and al., 2007; Wang et al., 2007; Sequeira et al., 2009). The chemical composition and the porous internal structure of zeolite, as well as the experimental conditions for adsorption, influence the zeolite's selectivity for metallic ions (Erdem et al., 2004). In general, clinoptilolite has a well-known higher preference for Pb2+ and Cd2+ than for Cu2+, Co2+ and Ni2+. This happens because clinoptilolite prefers cations with lower dehydration energy, lower hydration radii and higher mobility. Adsorption of heavy metals by clinoptilolite, the most used natural zeolite found in different types of volcanic tuff, has been the focus of many research studies (Mier et al., 2001; Petrus and Warchol, 2005; Sprynskyy et al., 2005; Karadag et al., 2006). The main research goals of most of these studies are to establish the adsorption mechanism, to find and explain the order of selectivity for different heavy metals and to compare, in quantitative terms, the influence of different factors on the adsorption capacity. (vii) diffusion of counter ions along the same path back to the external solution. Under dynamic conditions, in heterogeneous systems, the diffusion of ions from the external solution into the film at the particle surface would not be the rate-limiting step. On the other hand, in solution, the ions exist only in the hydrated form. The volume of these hydrated ions depends on both the dehydrated ionic radius and the electric charge of ions. So, the ionic hydrated radius can affect mobility through the channels in the internal structures of zeolites, meaning the steps involving diffusion from the film, macro- and micropores can be the rate-limiting step of the mechanism. Also, the diffusion of different counter ions back into solution can affect the mobility of metal ions. Different hydrated ionic radii generate different dehydration energys. Cations with large hydrated ionic radii have high dehydration energy, thus affecting Step (iv). Generally, the rate-limiting step in the adsorption of heavy metal ions on zeolite can be: diffusion in the external film, diffusion in pores, dehydration of ions and the binding of ions on the active site. Step (vi) can be explained in correlation with the activated form of zeolite. Many research papers present different equations which can be useful for establishing the step of lowest speed in the mechanism of adsorption of heavy metal ions onto zeolite. The objectives of this study, as stated above, sought to establish the mechanism of adsorption of lead onto Na-modified clinoptilolite and to assess the role of pH in the adsorption process. Clinoptilolite rock samples from the Stoiana Village deposit, Cluj County (Romania), containing 63% clinoptilolite, were used for the experiments described in the study. The main mineral and chemical characteristics of the samples are listed in Table 1. The chemical composition was obtained using wet chemical analysis while the mineral composition was obtained using a DRON X-ray powder difractometer connected to a data acquisition and processing unit to record the XRD patterns, which allowed for the determination of the parameters of the crystalline network of the zeolite. We used CuKa radiation (λ = 1.540598 Ǻ) and a graphite monochromator. The XRD diffraction analysis revealed the crystalline structure of zeolite, with average crystallite diameter of 75.74 nm. Clinoptilolite samples were ground in a mortar (Retsch RM 100, Germany) and divided by mechanical sieves (Retsch AS200 basic) into 0.5-1.0 mm size fractions. These zeolite fractions were then washed with distilled water to remove any turbidity and dried at 105°C for 24 h to remove any adsorbed water. Finally, the clinoptilolite samples were stored in a desiccator before performing the chemical activation to the Na-form. The chemical treatment of zeolite (clinoptilolite) was performed by adding 1 ℓ of 2 M solutions of NaCl to the samples of clinoptilolite (100 g) at 25ºC in continuous movement (orbital shaker Heidolph Unimax 1010 Inkubator 1000, Germany). After 24 h, the solid phases were separated from the solutions, washed until all Cl- ions had been removed (controlled with AgNO3 solution). The samples were then dried at 105ºC using a Binder oven for 24 h.
Adsorption-desorption isotherms of the investigated samples were determined in order to obtain the specific surface area and the pore size distribution. The surface area of the clinoptilolite was determined by the Brunauer-Emmett-Teller (BET) method. A Sorptomatic, Thermo Electron Corporation system coupled with a Flatron L1718S computer system was used. The partial pressure range was 0.05 < P/P0 <0.3. Nitrogen adsorption was carried out at 77K. 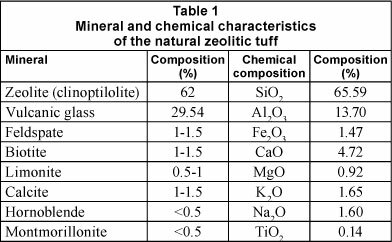 The basic parameters for the porous structure of natural and treated samples (Na-clinoptilolite) of the zeolite are presented in Table 2. The relative moisture content of natural clinoptilolite (7.27%) was determined by the thermometric method, drying the rock samples at 110ºC to constant mass. 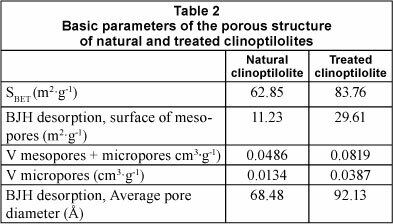 The specific gravity for natural clinoptilolite (2.1548 kg-ℓ-3) was determined by picnometric methods. The bulk density is 0.9402 kg.ℓ -3. By applying the NH4Ac method, the content of exchangeable cations (CEC) was found to be 64.85 meq-(100 g)-1 for natural clinoptilolite and 173.62 meq-(100 g)-1 for treated clinoptilolite. The concentration of metal ions was determined in a filtered solution (the adsorbent was removed by filtration using Whatman paper no. 42, (7-9 μm retention particles)) by means of an atomic absorption spectrophotometer (Perkin Elmer Analyst 800, Shelton, USA), using the air-acetylene flame, 283.3 nm wavelength, 0.7 nm slit, with background correction. The standard deviation of the measurement was from 0.01 to 0.1%. The pH of the solution was determined using an Inolab pH 730 apparatus. The equilibrium isotherms were determined by mixing 1 g Na-clinoptilolite with 100 mℓ of a solution of lead ions in cylindrical flasks. The flasks were placed in a thermostatic stirrer (Heidolph Unimax 1010 Inkubator 1000, Germany) at 25ºC for 24 h at a fixed agitation speed of 200 rmin-1. At the end of the reaction (24 h), the concentration of the residual metal was determined by atomic absorption spec-trophotometry. Additionally, the concentration of lead in the aqueous phase was measured after pre-established periods of time. All of the batch equilibrium and kinetic studies were performed in 3 replicates of dried Na-clinoptilolite. The standard reproducibility deviation was from 0.1%> to 4%. In order to estimate the specific constants of the adsorption isotherm or of the adsorption kinetic models, a linear regression analysis (y = A + B . x) was adopted. The criterion considered was the minimisation of the squared sum of errors between the predicted values (qcalc) and experimental data (qexp). The CurveExpert 1.37 freeware and Statistica 7.0 were used in all calculations with the confidence level set at 95%. In order to evaluate the hydrochemical equilibrium species, Hydra and Medusa were used (freeware available from the Royal Institute of Technology, Sweden). In this study, the adsorption isotherms have been described by 3 commonly-used models, namely: Langmuir, Freundlich and Dubinin-Radushkevich. the adsorption on an active centre has no influence on the adsorption on other active centres. The constants qm and b were obtained from the slope and intercept of the plot of (Ce/qe) versus Ce. Table 3 includes the parameters of the Langmuir model for the adsorption of lead by Na-clinoptilolite. n are equilibrium constants indicative of the adsorption capacity and adsorption intensity, respectively. The constants KF and n were obtained from the slope and intercept of the plot of log(qe) versus log(Ce). Table 4 gives the parameters of the Freundlich model for the sorption of lead by Na-clinoptilolite. T the absolute temperature (K). The constants β and Xm were obtained from the slope and intercept of the plot of ln(qe) versus F2. The parameters of the D-R model for the sorption of lead by Na-clinoptilolite are presented in Table 5. If the magnitude of Es is between 8 and 16 kJ.mol-1, the adsorption process proceeds by ion exchange, while for values of Es < 8 kJ.mol-1, the adsorption process is of a physical nature (El-Kamash et al., 2005). The experimental data are shown graphically in Fig. 1. The predictive precision of the isotherm models, considered as a function of their respective relative errors, was determined to be highest for the Dubinin-Raduschkevich model 4.63% (the average normalised standard deviation error) followed by the Langmuir model 7.90% and the Freundlich model 15.98%. This order shows that the mechanism which occurs is chem-isorption on a monolayer and heterogeneous surface (Garcia-Mendieta et al., 2009). The theoretical maximum monolayer adsorption capacity, established based on the Langmuir isotherm (qm), decreases as the pH of the solution decreases (Inglezakis et al., 2002; Davila-Rangel and Solache-Rios, 2006; Taffarel, 2009). Therefore, the decrease in pH between 4 and 1 induced a decrease in the maximum adsorption capacity from 0.3569 to 0.1604 mol.kg-1 (i.e. a 55.06% decrease). The maximum adsorption capacities calculated based on the D-R isotherm (Xm) are higher than those calculated using the Langmuir isotherm (qm), and as such cannot be used for the mathematical modelling of adsorption capacities. Other authors have observed differences of the same nature and magnitude between the 2 models (Gunay et al., 2007). The importance of the D-R isotherm consists in the calculation of Es which offers information about the nature of the adsorption process. In the particular process researched, the value of the adsorption energy decreased from 9.72 to 7.62 kJ.mol-1 as the pH decreased from 4 to 1. The value indicates that, at low acidity (pH = 4), the adsorption mechanism is one of ionic exchange; while at high acidity (where the adsorption occurs slowly) the adsorption process is physical in nature, thus reducing the strength of the bond between metallic ions and the adsorbent substrate. KDocan be obtained from the intercept of the plot of ln (qe/Ce) versus qe (as indicated in Table 6). The distribution coefficient (KDo) implicitly indicates the selectivity, capacity, and affinity of an ion for ion exchange (Inglezakis et al., 2004). The interpretation of experimental results led us to conclude that the distribution coefficient (KD0) decreases as the pH decreases. This means the affinity and strength of the interaction between lead ions and zeolite decreases dramatically as the pH decreases. The change of free energy (ΔG0) follows the same pattern. As the pH drops from 4 to 1, the change of free energy increases, suggesting the occurrence of a spontaneous adsorption process. The speed of this process is higher at lower acidity. To examine the adsorption kinetics and mechanism, 5 kinetic models were applied: the pseudo-first and pseudo-second order (sorption kinetic models based on reaction order), the intra-particle diffusion Weber-Morris and models of diffusion through the particle surface (kinetic diffusion models used to check whether the sorption process occurs via an external or intra-particle diffusion mechanism), and the heterogeneous diffusion model (which assumes the variations of the diffusion rate through zeolite particles). In each experiment, an aqueous solution with the same initial concentration of lead ions (namely 923.14 mg- ℓ-1) but different pH (variable between 1 and 4) was used. Pseudo-first and pseudo-second order models are two of the most widely used models for the adsorption of a solute from aqueous solution. qe and k1 can be determined from the intercept and slope of the plot, respectively. k2 (kg.mol-1.min-1) is the rate constant of second-order model. The plot of t/qt versus t should give a straight line if the pseudo second-order kinetic model is applicable, and qe and k2 can be determined from the slope and intercept of the plot, respectively. The 2 parameters can be determined from the intercept of the plot of qt versus t0.5. The intercept (Id) is used to examine the relative significance of the 2 transport mechanisms of the solute, namely: intraparticle diffusion and external mass transfer (film or surface diffusion through the film surrounding a zeolite particle). If I = 0, the intraparticle diffusion is considered as the rate-limiting step, while, if I > 0, both the external mass transfer and intra-particle diffusion are considered as the rate-limiting steps. An increase of I translates to a higher resistance to ions of the layer of liquid surrounding the particle of zeolite. The Weber-Morris model is of paramount importance as it enables the determination of the diffusion coefficient of ions inside the adsorbent material (Apiratikul and Pavasant, 2008). De is the effective diffusion coefficient (m2.min-1) and d is the mean diameter of particles (m-1). At high values of pH of the solution, the formation of metal-complexe species can be possible (the main species being Me(OH)+). The mobility of ions in the external fluid, as well as in the internal channels, can be affected by these species, on the one hand, while an ion could be exchanged as a monovalent cation on the external or internal surface, on the other hand. The formation of these species could have an influence on the ion exchange process (Oren and Kaya, 2006; Inglezakis et al., 2007). p and C are dimensionless constants. The constants p and C were obtained from the slope and intercept of the plot of (αt) versus ln(t). 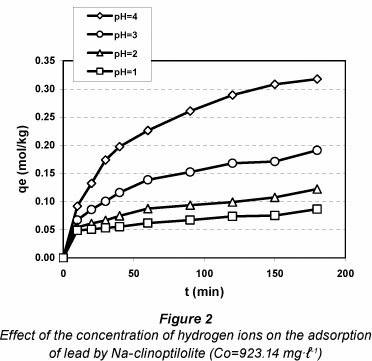 The adsorption of lead ions by Na-clinoptilolite increases with time and reaches equilibrium after 180 min (Fig. 2). The adsorption is faster during the first period of time and occurs more slowly afterwards. The pH of the contact solution has a negative impact on the adsorption capacity. When the solution pH decreases from 4 to 1, the experimental equilibrium adsorption capacity decreases from 0.3176 to 0.0866 mol.kg-1 (which means a decrease of 72.72%). This happens because during adsorption at lower pH values the hydrogen ions compete with the ions under investigation (Argun, 2008). 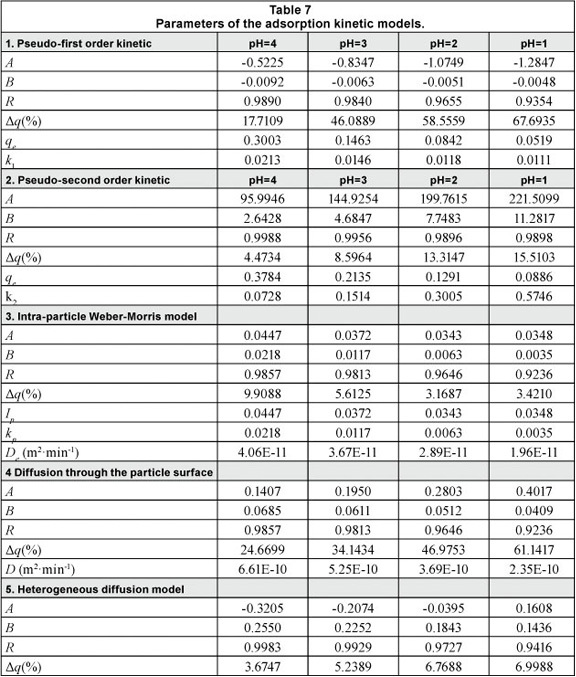 The predictive precision of the kinetic models, as a function of the relative errors, was found to be highest for the intra-particle Weber-Morris model, and decreases in the following order: heterogeneous diffusion > pseudo-second order kinetic model > diffusion through the particle surface > pseudo-first kinetic model (as indicated in Table 7). The average values of the normalised standard deviation for all the considered models in which the pH was modified were as follows: 5.53, 5.67, 10.47, 41.73, and 47.51%. The pseudo-second order kinetic model described the experimental data better than the pseudo-first order model, which is in agreement with the conclusions of other authors (Sprynskyy et al., 2006). The calculated qe values using the pseudo-second order kinetic model are also close to the experimental data. Using the pseudo-first kinetic model, the equilibrium concentrations are smaller than the experimental data. Regarding the intra-particle Weber-Morris diffusion model, the low values of Id had a relatively constant variation (the average of value was 0.0377 with a relative standard deviation of 12.72%), but with a decrease in pH from 4 to 1 the intra-particle diffusion coefficients (De) decrease between 4.0610-11 to 1.9610-11 m2min-1 (a 51.72% decrease). 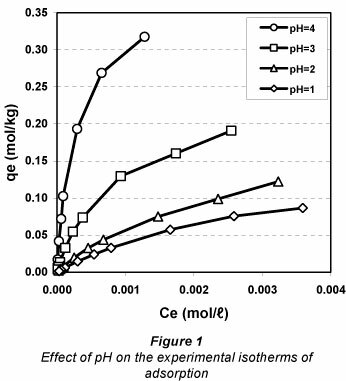 The diffusion coefficients from the external surface of particles (D) for the same pH range decrease from 6.6110-10 to 2.3510-10 m2min-1 (a 64.37% decrease). The film diffusion coefficient is 10 times higher than the intra-particle coefficient. This means that diffusion to the external surface cannot be the rate-limiting step in the adsorption mechanism; instead, diffusion through the internal porous structure is the rate-limiting step. The order of magnitude for the calculated distribution coefficients is the same as the order of magnitude observed in other papers (Inglezakis et al., 2002, 2004). This suggests that 2 factors induce the reduction of the adsorption capacity as a function of the pH, namely: the mobility of hydrated lead ions decreases and hydrogen ions with a lower hydrated radius competitively adsorb the divalent hydrated ions of lead. At the same value of contact solution pH, the diffusion coefficient does not depend on the concentration of the adsorbent ions. This means that in acidic solutions an increase in the concentration of hydrogen ions affects the mobility of lead ions. In the internal porous structure of zeolite, the same phenomenon occurs. The analysis of the normalised standard deviation revealed that the Weber-Morris diffusion model describes the experimental data better for decreasing values of pH of the contact solution. As pH decreases from 4 to 1, the relative standard deviation decreases from 9.91% to 3.42%. An inverse variation between pH and standard deviation can be observed in the case of the heterogeneous diffusion model. The relative standard deviation increases from 3.67% to 6.99% as the pH decreases from 4 to 1. The minimum values of relative standard deviation recorded at pH=1 for the intra-particle Weber-Morris diffusion model (3.42%) and at pH=4 for the heterogeneous diffusion model (3.67%) can be explained by considering the different hydro-chemical equilibrium species formed under different pH regimes of the contact solution. 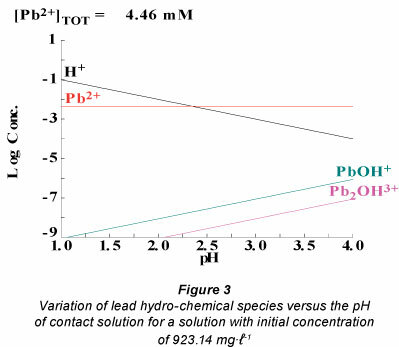 Figure 3 presents the different species containing hydrated lead ions as a function of the pH of the contact solution for a solution with an initial concentration of 923.14 mg-ℓ-1. The spe-ciation diagram was obtained using Hydra and Medusa specia-tion modelling freeware versions. At different values of pH, different species containing hydrated lead ions are generated. The concentration of Pb(OH)+ depends on the pH of the solution. Thus, at pH = 4, the concentration of the complex is 10-6.02 M. At pH = 1, the concentration becomes 10-9 M.
In low acidic media (pH = 4), the equilibrium presented in Reaction (26) shifts to the left and more highly charged metal complexes are formed as compared with those generated in high acidic media (pH=1). This behaviour is beneficial for adsorption. The hydrated radius of the lead complex ([Pb(H2O) x-1(OH)]+) is smaller than that of the hydrated radius of lead ion ([Pb(H2O)x]2+), meaning that the hydrated radius of the lead complex results in higher mobility than that of the hydrated lead ion. Moreover, the adsorption capacity of [Pb(H2O) x-1(OH)]+ is higher than that of [Pb(H2O)x]2+ because the adsorption capacity of monovalent ions is higher than that of the divalent ions. In some cases, given the inability of the ions to diffuse through the micropores of particles, there will be no adsorption at all. Other researchers have also confirmed the existence of the equilibrium as in (26); the effects induced by this equilibrium suggest that either the adsorption process is not stoichiometric (Peric et al., 2004) or that the pH changes during the adsorption process (Trgo et al., 2006b). By fitting experimental data to the kinetic and isothermic models, the correlation coefficients (r) of a number of representative parameters were calculated in order to validate the mechanism by which ions of lead are adsorbed by Na-clinoptilolite. Table 8 presents the values determined for the correlation coefficients obtained between parameters in the following models: Langmuir, Dubinin-Radushkevich, distribution coefficient, Weber-Morris, diffusion through the particle surface. The best correlation seems to be between the pH of the contact solution and the diffusion coefficients (D and De), which substantiates the hypothesis that the diffusion process of hydrated lead ions through the pores of zeolite particles depends on the concentration of hydrogen. The variation of the Gibbs free energy (∆G°), the maximum adsorption capacity (qm) obtained from the Langmuir isotherm and the sorption energy (E) obtained from the D-R isotherm indicate a strong correlation with the pH. The values for the relative standard deviation (∆q%), as obtained by fitting the kinetic experimental data on the heterogeneous diffusion model reveal that the correlation coefficient is smallest at pH = 4. Adsorption of lead onto Na-clinoptilolite has been found to be predominantly based on a monolayer mechanism in which the pH of the contact solution has an important influence on the way the hydrogen ions compete. The speed of diffusion of ions is higher on the external surface of the zeolite than in its internal structure. At high pH of the contact solution, adsorption occurs by ion exchange while at low pH, the process is physical. On the basis of free energy change, we can conclude that the process occurs spontaneously and is more pronounced at low acidity. The affinity between lead ions and zeolite (evaluated on the basis of the distribution coefficient) decreases with a decrease in pH. Diffusion through the internal structure of macro- and micropores plays an important role in the adsorption mechanism and is the slowest among all stages of the diffusion process. The intra-particle diffusion coefficient depends on pH which can modify the type and the concentration of the hydrated metal complexes in solution, thus affecting the adsorption process. This research was undertaken within the ANCS, ZEMIP no. 82AS/2008 - Romania - South Africa bilateral project which is part of the Romanian National Plan of Interdisciplinary Research and Development Program PNCDI 2007-2013.